Support for Open Trade Remains Robust in Recent Polling. Trump’s Tariffs Still Remarkably Unpopular. This is the fifth article in a series produced by NDN challenging Trump’s tariffs. Given the conventional wisdom about how Trump won the Presidency in 2016, one would expect to find broad support for his protectionist trade policies and his tariffs in particular. A review of recent polling, however, suggests the American people are far more supportive of open trade policies and less supportive of tariffs than many would have expected. In fact, by some measures, Trump’s tariffs are among the least popular policy initiatives of his Presidency. Using the Polling Report site as reference, let’s look at some data. The August NBC/WSJ poll asked “In general, do you think that free trade between the United States and foreign countries has helped the United States, has hurt the United States, or has not made much of a difference either way?” 50% said helped, only 23% said hurt. A July version of that poll asked about Trump’s tariffs — 25% said they would help the economy, 49% said hurt. An April Pew poll found similar numbers with 56% saying free trade was a good thing for the US and only 30% saying it was bad. A June Monmouth poll found 52% believing free trade agreements between the US and other countries were good for the US, only 14% disagreed. A March edition of the NBC/WSJ poll asked the question a slightly different way: “What do you think foreign trade means for America? Do you see foreign trade more as an opportunity for economic growth through increased U.S. exports, or a threat to the economy from foreign imports?” 66% said opportunity for growth, only 20% said threat. Summer polls from Pew and Quinnipiac found slightly better but still net negative spreads for Trump on tariffs and free trade (39/50, 40/49). The new ABC/Washington Post poll out this week found a similar 41/50 split on Trump’s tariffs. In the Quinnipiac poll, however, a whopping 73% said a trade war would be bad for the US economy. Only 17% said good. 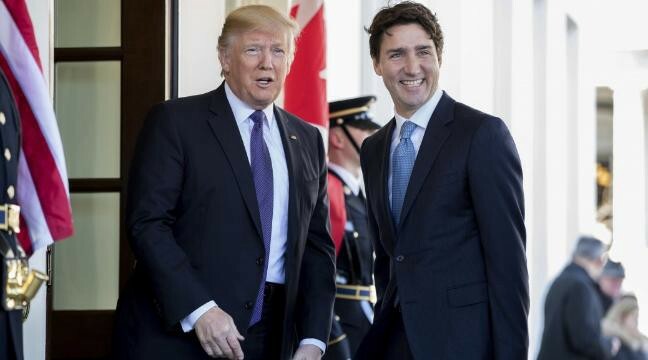 A June Suffolk poll found only 35% support for the NAFTA renegotiation, and a June CBS poll found support for tariffs on Canada to be only 27% (62% disapprove). In a June CNN poll, 63% said it was better for the US to maintain relations with our close allies rather than impose tariffs. Only 25% said tariffs were better. In polls which broke out the numbers by party, an overwhelming majority of Democrats come out in favor of free trade and against tariffs. Two examples. 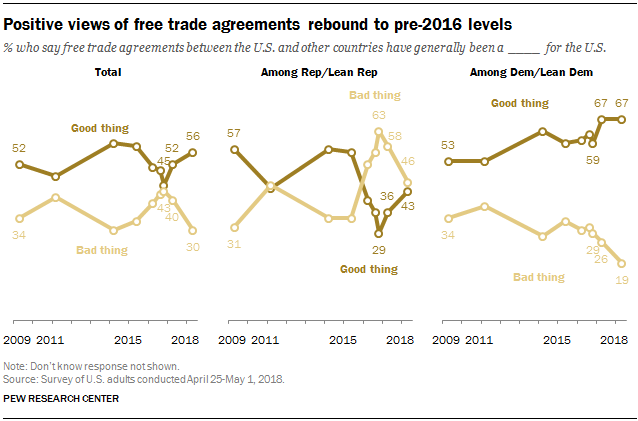 In the spring Pew poll, 67% of Democrats said free trade was a good thing, just 19% said bad. 63% opposed the tariffs, just 22% supported. In the new ABC/Washington Post poll, which found support of Trump’s tariffs to be at 41% support/50% opposed, Democrats opposed them 75% to 18%. Recent state polls have similar findings. A series of Marist/NBC polls found support of the tariffs to be 23/42 in IL, 29/41 in MO, 28/46 in PA and 33/40 in Texas (links here and here). A recent Suffolk University poll (pp 22–23) of Wisconsin found support for the tariffs on China to be 39/47, and on “EU, Canada and Mexico” 31/57. That the popularity of a major Trump policy initiative is under 33% in states like Missouri, Pennsylvania and Texas is pretty remarkable. While trade is obviously a complicated and tough issue, the idea that there is broad support in the US for protectionist policies, and tariffs in particular, just can’t be supported given this data. Trump has failed to persuade the American people to get behind his trade wars, and in fact, the Pew data suggests more people today are supporting the basic notion that free trade is good than a year ago. Early in his Presidency, Trump’s trade policies have generated more of a backlash than a groundswell of support. As we’ve written elsewhere, Democrats would be smart to study this data and do some polling and market research of their own. Putting it all together suggests that an extended campaign by Democrats calling on Trump to rescind his tariffs — like the one NDN has been calling for — would not only be smart policy and good for the US economy, but smart politics too. The highest percentages ever registered in this survey (since 2004) say that trade is good for the US economy (82%), good for consumers like you (85%), and good for creating jobs in the U.S. (67%). Support for NAFTA is also at its highest level yet (63%), and a majority (61%) supports US participation in the revised Pacific trade agreement, the Comprehensive and Progressive Agreement for Trans-Pacific Partnership. Democrats express the most favorable views of these two trade agreements, while majorities of Independents now also support them. Although Republicans as a group tend to oppose them, a majority of non-Trump Republicans — those with only a somewhat favorable or an unfavorable view of the president — support them, demonstrating splits within the party faithful. Seven in ten are concerned that a trade war with China will hurt their local economy; while just over half are concerned about the impact of a trade war with Mexico. In both cases, trade wars are a greater concern for Democrats.